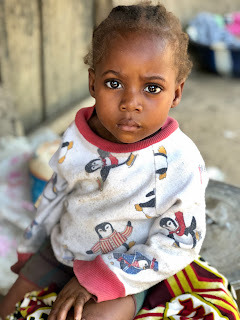 Traveling With Purpose: The sights and experiences of revisiting Liberian clean water villages. 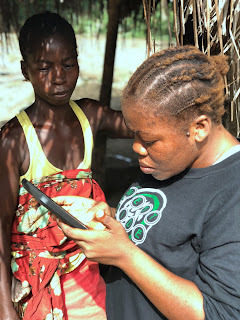 The sights and experiences of revisiting Liberian clean water villages. Walking into a Liberian village for the first time in a long time kicked my senses into high gear. I could feel poverty again on a different level as I was surrounded by small grass huts that were homes for the villagers. The scenery was awesome, but the living conditions would be challenging if I were to live here. 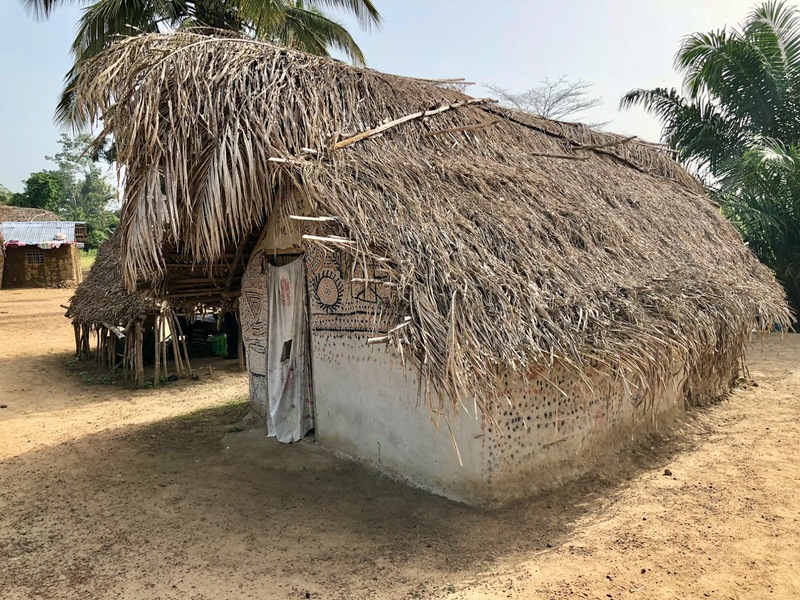 Thatched roofs, dirt floors, an outdoor kitchen consisting of a fire pit, and buckets for water were the norm. The smell of a fire pit and a large deep pan of cooked rice were reminders of what lunch would look like, their first meal of the day. As I walked around the village someone reminded me that it is harvest season here in Liberia. Rice was being harvested which provides the main staple of food. Almost every household had someone in the front yard pounding raw rice with a large wooden rod into a carved out tree trunk. Even the children were getting in on this chore as they must prepare their own rice in order to cook it and eat it. 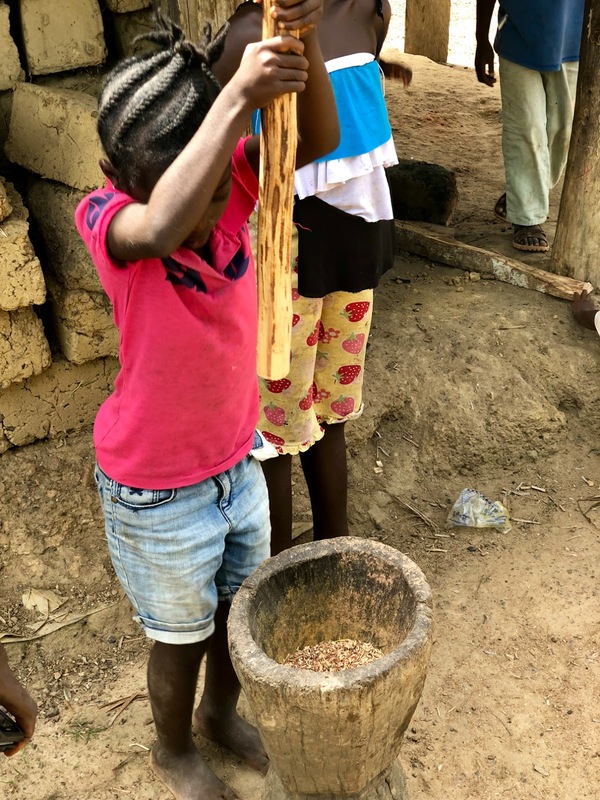 The children let me take a turn in the pounding and I quickly learned that villagers must work hard to prepare their food. Bananas were in season and we enjoyed a large bunch that we were able to purchase for $1. Kasava was also being harvested and nothing went to waste. Even the leaves for the Kasava plants were being pounded the same way as the rice, grinding it down into something that looked like parsley flakes. These flakes would later be boiled and served over the rice for a traditional Liberian meal. Two meals a day at most would be the norm here. There were chickens running around everywhere and a few dogs that really didn't like me being there. They growled but kept their distance. What always stands out to me in the villages is the children. Just in like every village, there are several kids that warm right up to a visitor, and then a bunch of kids that seem nervous at best. Some would duck for cover behind their parents as we approached the house to do a follow up on the clean water filter systems. Am I really that scary? I guess a tall, white-headed man was something they had never seen. Follow-ups are a big part of the sustainability of the Sawyer filters and they serve as an opportunity to see if the villagers are using and cleaning their filter systems properly. We learned a long time ago that sustainability is all about "behavior change." 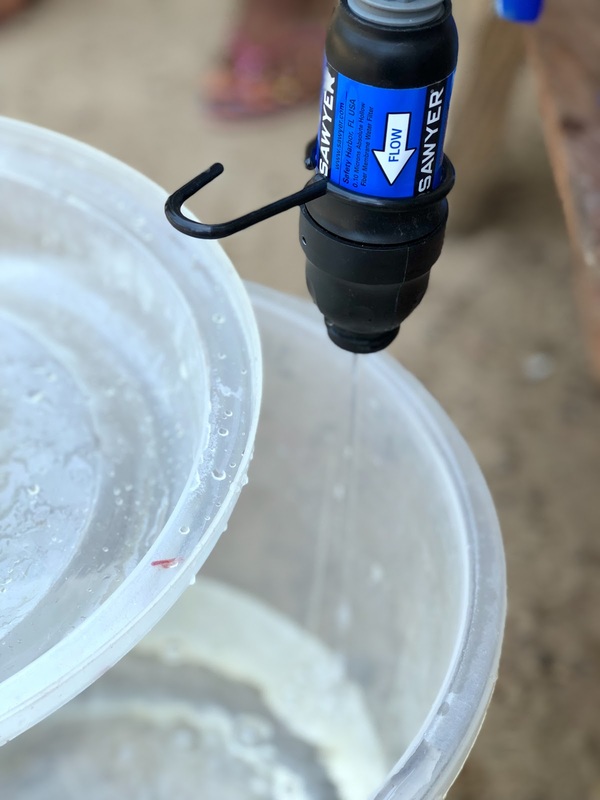 Without the villagers taking to the newly learned behavior of filtering their water and cleaning their filters, these amazing water filters would have a short lifespan. So we give continuing education and training to each family who received a filter system so they can demonstrate proper use and maintenance of the filters, and so the filters will last for years. We visited 8 different villages for what would be the 2nd round of follow-ups. Follow-up number 1 comes at the 2-week mark, and follow up number 2 comes at the 8-week mark. Nearly every person in these 8 villages was doing an awesome job of using and maintaining their systems. We only found 1 system that had a really clogged filter. With a little backflushing, we were able to get that filter working properly again, and it provided us a great opportunity to reinforce the behavior of cleaning the filter. Turns out, that family had damaged their cleaning plunger so we were able to replace it and teach them the idea of sharing with other families should that ever happen again. One thing was for certain. As we surveyed each family, we were confirming that they all had experienced major changes in their health. Runny stomach used to be a normal thing in all of the villages as they were all drinking contaminated creek water, but since they've received their Sawyer filter systems, their runny stomach has been eliminated, even though the creek is still their water source. It is really quite fascinating that something so simple could change so many peoples lives! It's a good thing for me to be in the field. It is always a reminder of how most of the world lives every day. But even with so much poverty, there is joy in the lives of these villagers. How could this be? 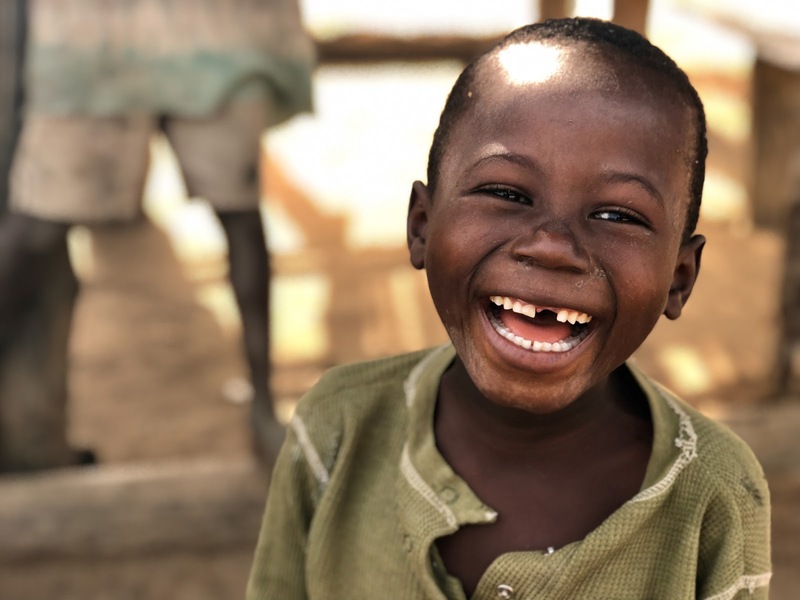 Well, it's certainly not driven by material things, but rather a deep joy from faith, family, community, and now a new level of thriving with the gift of clean drinking water.